How fast are elements sinking in the ocean? The sinking of elements in the ocean influences many important processes such as deep ocean carbon storage and the availability of trace metals for phytoplankton. Previously, quantification of this sinking flux has been done using sediment trap deployments or tracer measurements of a particle-reactive radioisotope. Since sediment traps and each particular radioisotope each have caveats in how they quantify sinking flux, sinking particulate flux measurements, especially trace metal fluxes, are especially sparse, with relatively large uncertainties. For the first time ever, in the U.S. GEOTRACES North Atlantic campaign (GA03), four types of radioisotope data (thorium-234, polonium-210, thorium-228 and thorium-230) were measured, along with a periodic table’s worth of particulate elements that can be used to quantify sinking fluxes at locations with prior sediment trap studies, including the Ocean Flux Program (OFP), for comparison. 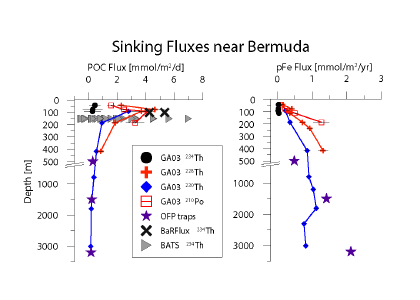 Sinking flux estimates of particulate organic carbon (POC) and particulate iron (pFe) derived using different methods, including the different radionuclides labelled and sediment traps from oceanic sites near Bermuda. 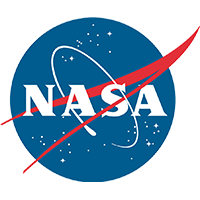 These include the Bermuda-Atlantic Time-series site (BATS), the Ocean Flux Program site (OFP), and the Bermuda Rise (BaRFlux site). The GA03 and BaRFlux data represent observations from 2012 and 2013. The triangles and stars represent data from throughout the time-series observations of those sites. 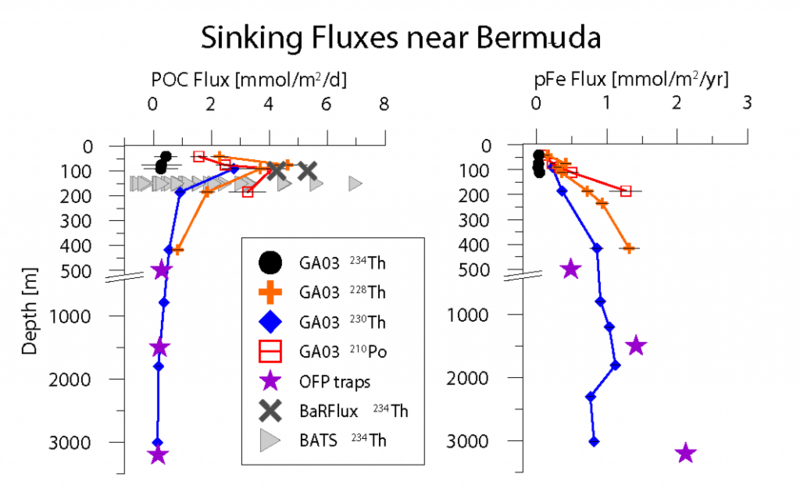 In a new study published in Global Biogeochemical Cycles, a team of collaborators synthesized all of the radioisotope and particle composition measurements from the GA03 cruise, as well as results from a nearby study called BaRFlux, to constrain sinking fluxes of carbon and eight trace elements (P, Cd, Co, Cu, Mn, Al, Fe and thorium-232) throughout the North Atlantic Ocean. The five different methods for constraining flux (sediment traps plus the four radioisotope methods) agree encouragingly well given the independent uncertainties associated with each method. Additionally, since the four radioisotopes have a range in half-lives from days to thousands of years, the different methods can reconstruct particle fluxes throughout the water column, from the dynamic bloom-and-bust-like changes near the surface to the relatively slow, long-term sinking into the abyssal ocean. 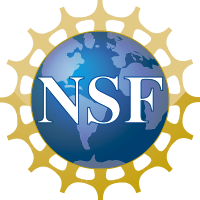 These fluxes will improve the understanding of the global budgets of carbon and trace elements. This study would not have been possible without the support of OCB and GEOTRACES who co-funded a synthesis workshop on biogeochemical cycling of trace elements at the Lamont-Doherty Earth Observatory in summer 2016.